A calendar box format is now available as well as the agenda list format. 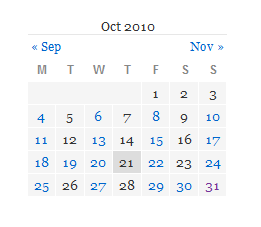 Both amr-events and the free plugin amr-ical-events-list will be able to choose the calendar format. A calendar widget is also be available. The large calendar is highly customisable. Screenshots show default css as at 2010 and as influenced by 2010 type themes. Current default styling with a recent wordpress theme is visible on the test site. picks up the start of week from your wordpress settings, so you can start with any day of the week, saturday, sunday or monday! default css aimed at providing a reasonable default while letting your theme work too. the small calendar widget is based on the wordpress posts wp-calendar code, so it’s operation and styling is very similar. It is hoped that it will then work well with your theme, if your theme has css for the standard wp post calendar. Optional customise the listtype settings to define which fields appear in which “columns”. Change the content definition yourself- the large calendar leverages off the existing “listtype” configuration. There is a default list type 9 setup as a default, which will work with the default css provided. For the large calendar, the listtype columns are not really columns. Col 1 is the day box, col 2 is what shows on hover of the event if you have the right css. And of course you can still add your before and after html to add further styling. Choose which fields and in what order are to be displayed in the first view of the calendar by allocating the fields to column 1. Column 2 fields are set to appear in the “hover” over the event. EG: Move event times from one to the other as you please. In order to retain html validation and still allow you flexibility (particularly since your content may contain html itself, this limited html choices), divs beingthe most flexible are used to isolate events and columns.